Chow Chow Vegetable( Chayote in English, Ishkus in Hindi, Seemai Kathirikai in Tamil, Seeme Badanekayi in Kannada, Seema vankaya in Telugu) makes its appearance in my kitchen at least twice a week. I make sambar, poricha kuzhambu and kootu with it. Chow chow poriyal was in my try list for long time as I have never seen my mom & MIL making poriyal with it. Here in Bangalore, most of the hotels serve this chow chow curry in their lunch thali. So I wanted to try that way. Its a very simple dry curry recipe but spicy in taste. People call it as Seeme Badanekayi Palya in Kannada. 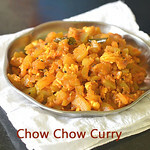 As chow chow vegetable is bland in taste, I have used spice powders to bring the masala flavor. I prepared this chow chow curry directly in a pressure cooker to ease my job. Yes it was done under 10 minutes. This recipe is ideal for bachelors and working women to whip up a quick side dish for sambar rice and curd rice. 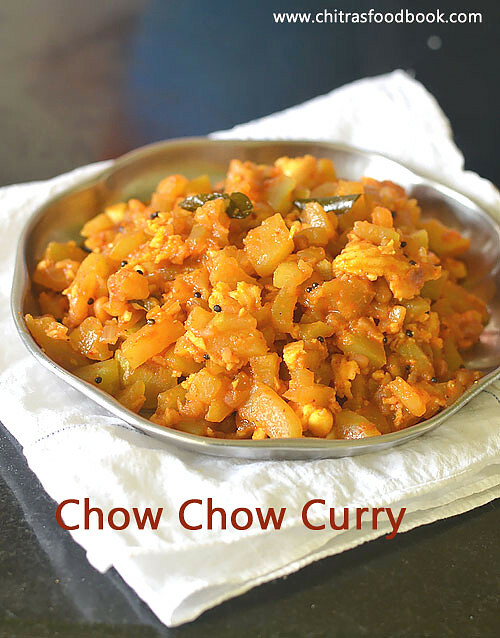 Do try this spicy chow chow curry for rice and enjoy. If you like, you can have it with roti a well. Check out my other PORIYAL RECIPES too ! 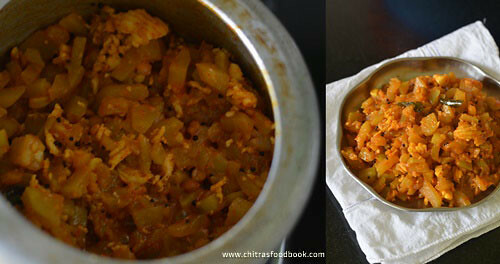 Chow chow poriyal for rice,roti - Chayote dry curry recipe, spicy in taste ! Wash and peel the skin of chow chow/chayote. Slice the head and tail portion. Chop into small cubes.Chop onion and garlic finely. Heat oil in a pressure cooker base. Splutter mustard seeds, urad & chana dal. Saute onion, garlic and chayote. Add salt and spice powders. Mix well. Add very little water and pressure cook in high flame for 2 whistles. Boil if there is excess water. Let it become dry. Lastly add grated coconut, mix well and serve ! Wash and slice the head and tail part of chow chow. Peel the skin completely and chop into cubes. Chop onion and garlic cloves finely and set aside. Heat oil in a pressure cooker base. Splutter mustard seeds, urad dal, chana dal and curry leaves. When dals turn golden, add chopped onion, garlic and chow chow cubes. Saute for a minute. Add turmeric powder, red chilli powder, dhania powder, garam masala powder and salt. Mix well. Add little water say 3 tbsp and mix well. Less water is needed because chow chow will release some water while cooking. Pressure cook in high flame for 2 whistles. Open the lid after steam is released. Mix gently and check for excess water. If its there, boil in high flame for a minute to drain all the water.Do not mix often because poriyal may become mushy. Toss gently. Poriyal should be dry. Lastly add grated coconut, mix well and serve with rice or roti ! Chow chow needs less water and less time to cook. So do not add more water while pressure cooking. Chow chow becomes mushy if you cook for more time in pressure cooker. So its better to cook in high flame for 2 whistles. It cooks in the steam itself. Adjust the quantity of chilli powder to make it more spicy. You can also skip garam masala powder but it adds a nice flavor to the curry. 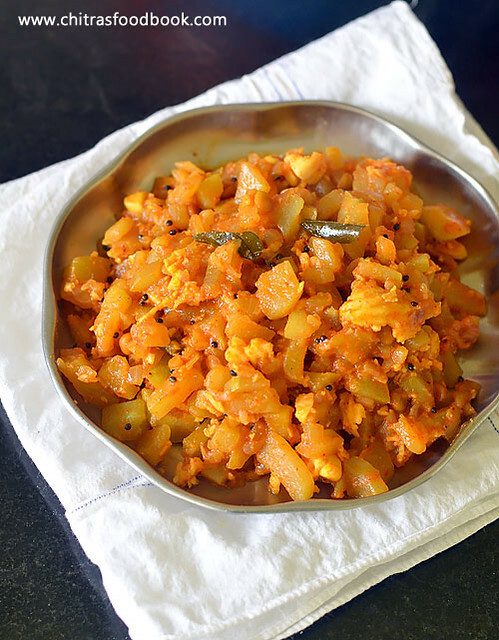 You can follow the same recipe and use bottle gourd / sorakkai instead of chow chow. 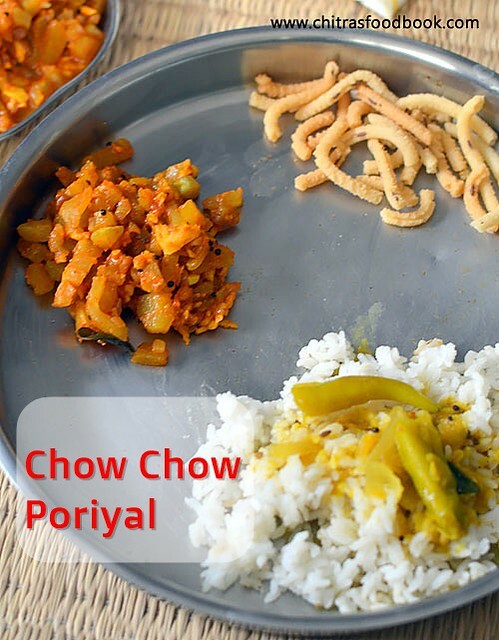 Try this easy, yummy chow chow poriyal at home and enjoy with sambar rice, rasam rice & curd rice.